The number of new visitors to the Northampton Recovery Center is picking up every week. Our new groups are filling up! New this coming week is a mindfulness group on Friday at 3pm with Bill Butcher. Bill will lead this for the remaining three weeks in June, and then will resume in September. We are happy to have mindfulness back in our toolbox. 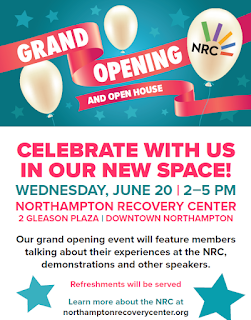 Don't forget to Save the Date for our Grand Opening at 2 Gleason Plaza on Wednesday, June 20 from 2:00 - 5:00pm. Light refreshments will be available. 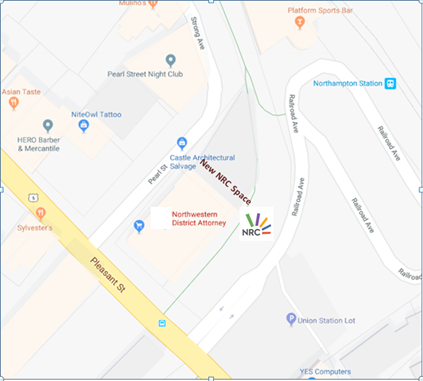 "Thanks to an anonymous donor, the Northampton Recovery Center, a peer-driven support group for drug abuse victims run by the Northwestern district attorney’s office, moved to a new site Monday and will soon expand its services and hours of operation. After operating out of Edwards Church for the last 18 months, the Recovery Center now has its own space at 2 Gleason Plaza."